'They Still Take Pictures With Them As If The Person's Never Passed' : The Picture Show In New Orleans, the lifelike representations have become a part of the city's tradition of social grieving and are a source of healing, especially in communities that have suffered from gun violence. Editor's note: This report includes images that some may find offensive. 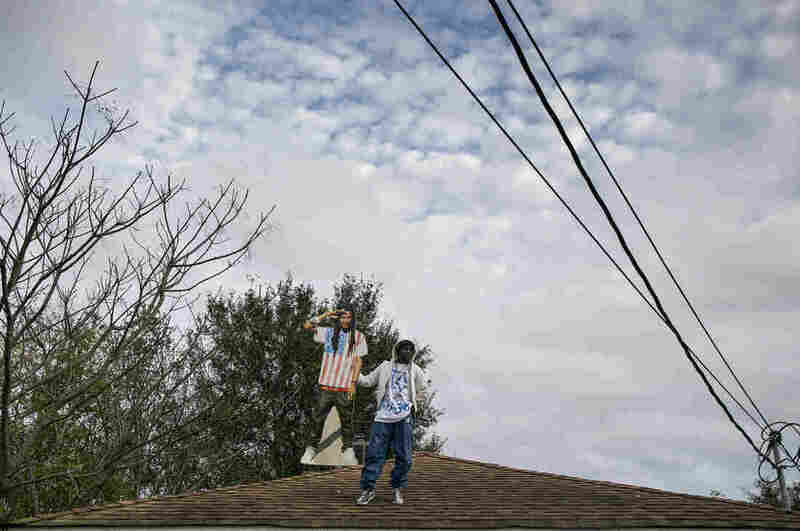 Ten years after Hurricane Katrina's devastation, photographer Tyrone Turner returned to his native New Orleans to report on the persistent rise of violence in the region. While photographing the funeral of Malik Braddy, an 18-year-old who was shot and killed in the Lower Ninth Ward, he noticed something striking: family and friends taking photos with, hugging and lifting into the air a life-size cutout of Malik. "When you take a selfie with the cutout, it looks like the person's there. I was really fascinated by it," Turner says. 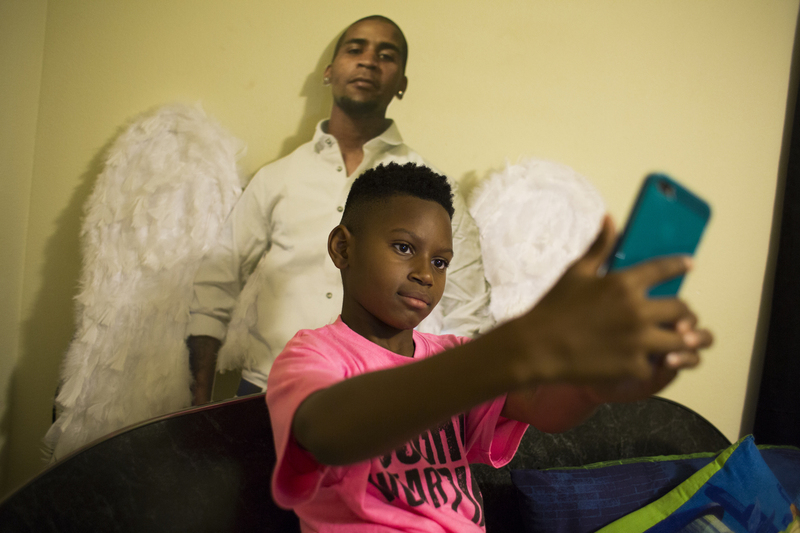 A few weeks after Javon Johnigan's shooting death on Sept. 3, 2016, his 8-year-old son Jamai demonstrates how he takes selfies with a life-size cutout of his father. Originally made for the funeral and the repast, Jamai keeps the cutout of his dad behind his bed. "We talk to him and take pictures with him," said Javon's mother, Elizabeth Johnigan. "It's a big help for someone who is grieving." Afterwards, he continued to see more cutouts displayed at black funerals around the city. 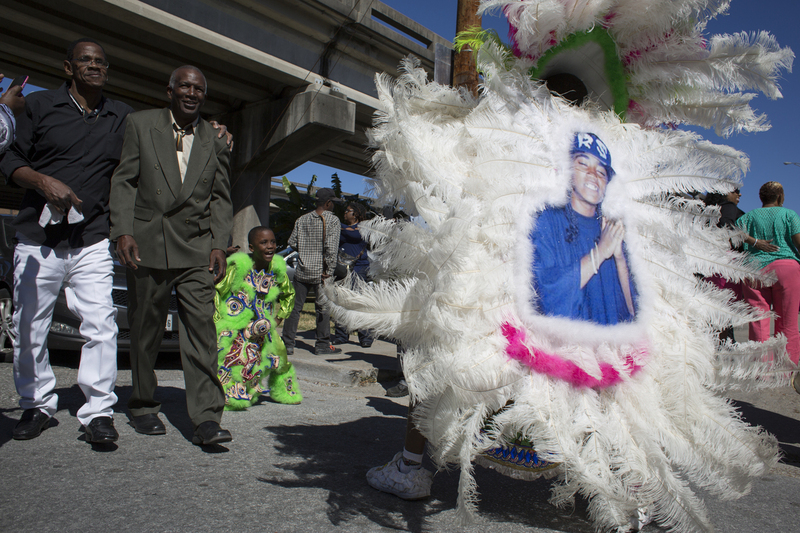 While covering a second line parade — a local tradition where people strut and dance to brass bands through the streets — Turner saw a man standing on a rooftop, dancing with a cutout of a young man who had been killed. The public and communal celebrations of the dead are powerful representations of black New Orleans, and cutouts have become a modern and unique tradition of its own. Though they are also used in other celebrations, such as birthdays and graduations, "lifesizes" — as they're sometimes referred to by locals — are most frequently made to remember young men, teenage to mid-20s, who died from gun violence. Compelled to learn more, Turner went on to photograph more than 20 families who used cutouts in their memorials. Over several years, during visits to his hometown, Turner discovered that the cutouts were more than a simple remembrance of loved ones; they were also a source of comfort and healing for families. 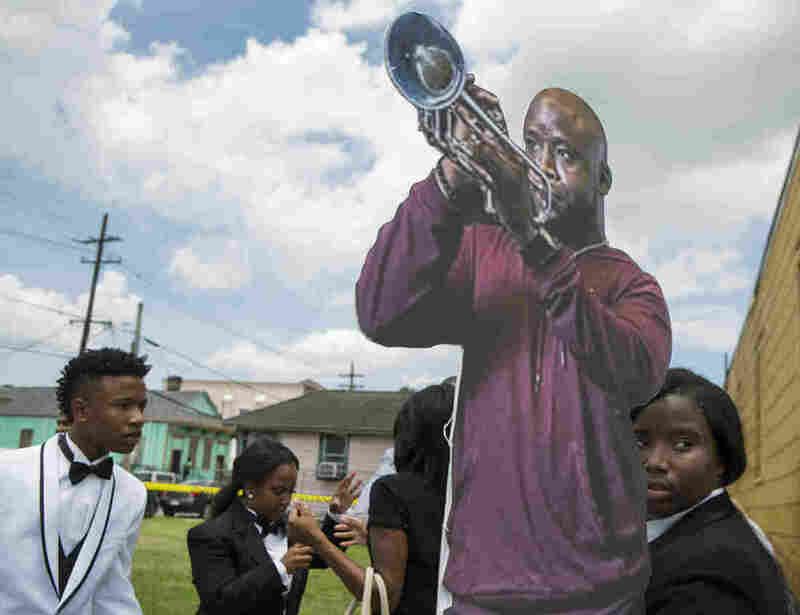 Family and friends carry a life-size cutout of New Orleans musician, Travis "Trumpet Black" Hill, during the jazz funeral for the 28-year-old. Hill died of an infection on May 4, 2015, while on tour in Japan. 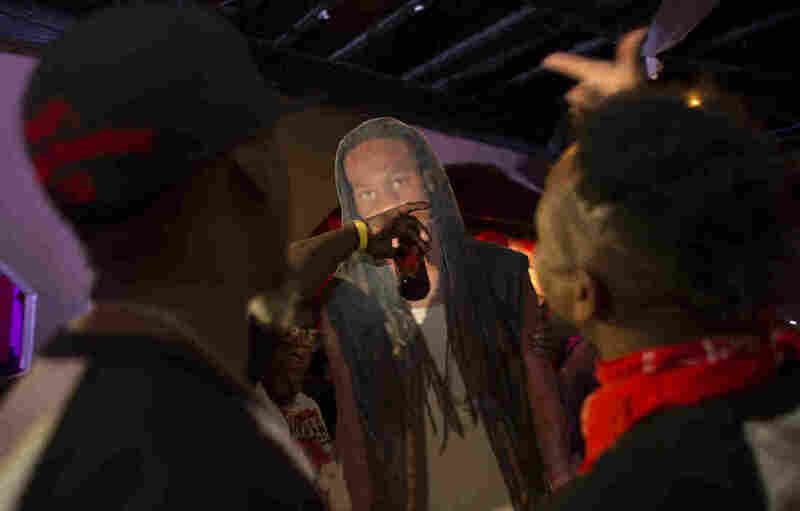 Made by the same vendors that make "Rest In Peace" T-shirts often worn at funeral gatherings, cutouts are prominently used in different ways: Some are displayed at funerals while most are shown at repasts, the lively party receptions held afterwards. There, family and friends interact with the cutouts, posing and smiling for photos. 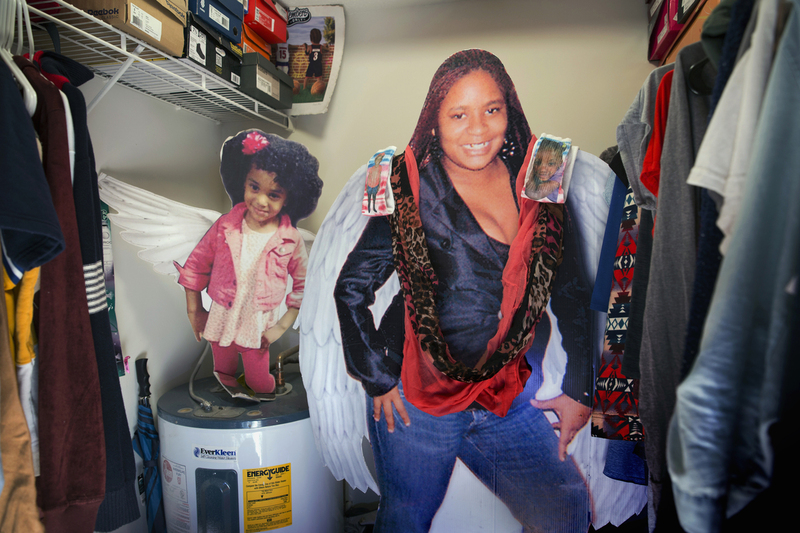 "They still take pictures with them as if the person's never passed," says Trenice McMillian, owner of Platinum Graphics, one of the main local cutout vendors. She says the cutouts hold a special significance, especially for the close friends of the young people who have passed away. "There's a lot of males who do not have father figures so all of these young people are basically family," McMillian says. "For them to be able to still go out, still have fun with this poster that's standing right alongside of them, it actually does really help them." As part of an industry and business that's on the front lines of grief and death, Platinum Graphics make about 10 to 15 cutouts per week and sees spikes in production in the summertime and around Mardi Gras. Making the cutouts changed McMillan's perspective on death. "I haven't dealt with death like [this] at all, but when I got into this business, it got really, really heavy," says McMillian, who lost a young 16-year-old cousin to gun violence several years ago. "You're kind of numb to it." A relative's closet holds two cutouts from the same family, both of whom died of pneumonia in 2013. On the right is Laquana Jones, 24, who died on Jan. 23, 2013. On the left is Laquana's niece, 3-year-old Shy Jones, who died on Dec. 26, 2013. During the second line parade of the Original Big Nine Social Aid and Pleasure Club, a man stands on the roof of a house with a cardboard cutout. Friends who live nearby explained that this was the cutout of Toby Roche, 24, who was killed on May 13, 2015, during a shooting in the parking lot of a restaurant near downtown New Orleans. McMillian says orders for cutouts are mostly placed by siblings and cousins and is a process that's often too difficult for the parents. "You have to constantly flip through phones to find pictures," she says. "Just going down memory lane like that is a lot on them." Cutouts can cost up to $150 and the quality varies. Sometimes high-resolution pictures are available, allowing lifelike representations to be produced, but often, families only have screenshots or photos downloaded from Facebook to use, creating fuzzy, grainy versions of their loved ones. Nevertheless, the cutouts almost always play an important role in the households, even after the funeral events. They may be placed in the homes of their mothers, prominently displayed in living rooms and dining areas, or they're tucked away into closets, to be brought out for special celebrations such as birthday parties. Turner met one woman whose son had died who would pull out the cutouts for her grandchildren to play with. They had two cutouts, until one of them become too worn down over time and had to be thrown away. Often, families will reorder and replace the cutouts, choosing new photos and poses. 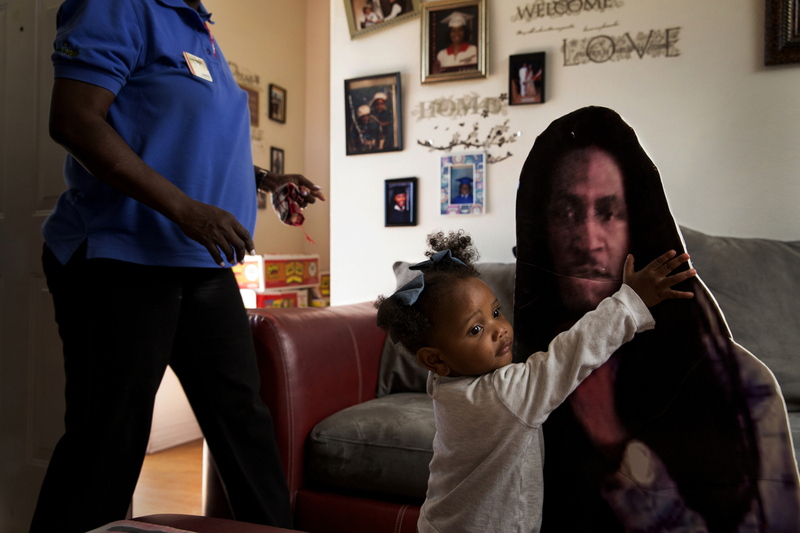 Khy Franklin, 1, plays with a life-size cutout poster of her father, Kent Franklin, who was shot and killed on July 18, 2016. He was 21. His mother, Tracy Williams, (left) lost both of her twin sons to gun violence. Keith Franklin died in an accidental shooting in 2007 when he was 12. This cutout is kept by one of Kent's friends, but Tracy said she had another poster of her son. Turner believes that the cutouts are "an uplifting thing" for the deceased person's friends who want to actually see them. "It's very different than the RIP T-shirts because it's their shape," Turner explains. "It's not like a big picture either, which has a frame and delineates this two-dimensional image; it's the same size that they were, [has] a natural pose. You can see their form and it's pretty powerful." Though it's hard to pinpoint how cutouts became a popular mainstay at black funerals, Turner says observing how they're used by grieving families and friends highlights a unique aspect of New Orleans' culture. "There's this need to grieve as a community, it's something that's very strong and prevalent [here]," Turner says. "People understand and value that this is a valid way of grieving." At the 2nd Annual Fallen Bikers Memorial Party in New Orleans on Nov. 12, 2016, fellow Insane Hunters bike club members celebrate with a cutout poster of Michael "Insane Flash" Troy Stradford-Francis. Jesse Carter, spyboy with the Mardi Gras Indian tribe, Shining Star Hunters, prepares to march in a jazz funeral in downtown New Orleans on Oct 22, 2016. On the back of his feathered costume is part of the cutout of his sister, Tyronika Carter, who he said was shot and killed in Houston in 2006. Turner hesitates to say New Orleans is the only city with cutouts, but he couldn't really find them prominently used anywhere else. Because of the diaspora of Hurricane Katrina, when many black families were forced to relocate to other parts of the country, some have returned to New Orleans — from as far away as Georgia, Texas and Virginia — solely to order and pick up cutouts from local merchants. For Turner, it's a poignant act. "Some may say [the cutouts] just keeps the hurt alive, but for them, they get a lot of strength from it, it's a big help in the grieving process," he says. Turner recently met an 8-year-old boy whose father had been shot and killed just two months prior. His family placed the cutout behind the boy's bed, where he takes selfies with it, placing Snapchat face filters on his father's likeness. The boy is in counseling to help him with his grief, and having the ability to pose and smile with the cutout is an integral part of his healing. "It seems to help that his dad is still a part of his life," Turner says. "And I get that." Tyrone Turner is a visuals editor and photographer at WAMU.